John Stewart is the name of a DC Universe comic book character who's superhero name is Green Lantern. His animated debut came in 2001 in the Justice League animated series. He was a core member of the group, appearing in most of the episodes of the show which lasted for 52 episodes. His power came from his power ring with which he was able to will himself to fly and create green constructs. The character was a former marine and he brought that ethic to the team. He was voiced by Phil LaMarr in the show. 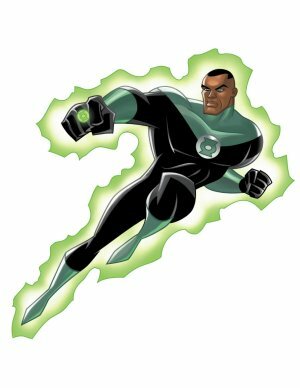 He was not the first character to bear the name Green Lantern, not even the second actually, but he was the first African-American to do so. As the story is told, there are many Green Lanterns policing various sectors across the universe and more than one of them are human. For the most recent generation of children, he is the only Green Lantern they know which has caused some small controversy as the character to wear the ring in the upcoming movie is Hal Jordan, a white guy. For the record, Hal Jordan did actually become a Green Lantern in the comics long before John Stewart. So why can't a black man portray the green lantern in the movie????? In truth, John Stewart was initially only a substitute Green lantern. Hal Jordan was first and that's who the movie is about.